The 2011 Lexus RX 350 continues to raise the bar for design, engineering and luxury innovation in the luxury crossover segment. The RX coasts into 2011 with new Smart Stop Technology and additional exterior colors. 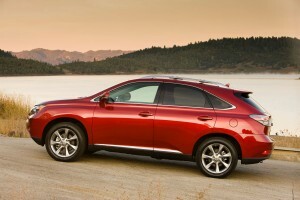 New exterior colors are offered to complement the 2011 Lexus RX 350’s refinement. Satin Cashmere Mica replaces Golden Almond Metallic. Stargazer Black is also added to the palette. The Lexus RX 350 teams a 3.5-liter V6 engine with a six-speed automatic transmission for an output of 275 horsepower and 256 lb.-ft. of peak torque. The Lexus RX creates a sleek profile that is accentuated by broad shoulders for an athletic yet elegant presence. The Lexus design cue of placing the grille lower than the headlights, along with sharper headlight graphics, yields a strong frontal expression. The dramatically designed interior clearly separates the interior into two distinct zones — the “display zone” to provide information, and the “operation zone” for interaction with controls. Neatly sculpted metallic surfaces, especially on the asymmetrical center stack, showcase a bold contrast of shadow and light. This entry was posted in Car Buying Research Starts Here, Lexus_. Bookmark the permalink.